Drawing on international research from public health, social policy, epidemiology, geography and political science, this book systematically demonstrates that work and worklessness are central to our health and wellbeing and are the underlying determinants of health inequalities. The material and psychosocial conditions in which we work have immense consequences for our physical and mental wellbeing, as well as for the distribution of population health. Recessions, job-loss, insecurity and unemployment also have important ramifications for the health and wellbeing of individuals, families and communities. Chronic illness is itself a significant cause of worklessness and low pay. This book demonstrates that countries with a more regulated work environment and a more interventionist and supportive welfare system have better health and smaller work-related health inequalities. Specific examples of policies and interventions that can mitigate the ill-health effects of work and worklessness are examined and the book concludes by asserting the importance of politics and policy choices in the aetiology of health and health inequalities. “I strongly recommend this volume as a way of stimulating a change of direction in the literature on the determinants of health and health inequalities” from the Foreword by Professor Vicente Navarro, The Johns Hopkins University, USA. Clare Bambra is Professor of Public Health Policy, Wolfson Research Institute for Health and Wellbeing, Durham University, UK. The Center for Social Epidemiology is happy to announce a Spanish version of our book, Unhealthy Work: Causes, Consequences, Cures has just been released by the Universidad de los Andes and is available for sale ($42.00 or COL$75,000). We would like to extend our thanks to our colleagues who translated the book: Viviola Gomez, Javier Garcia, Isabel Garcia, Arturo Garcia, and Leonor Cedillo and encourage those who can to read the new preface by authors Viviola Gomez Ortiz, Arturo Juarez-Garcia, Lya Feldman, Gisela Blanco and Aldo Vera. To obtain a copy of the book please go to: http://libreria.uniandes.edu.co/ and type the name of the book into its search engine. Marnie Dobson, and Ellen Rosskam, Amityville, NY: Baywood, 2009. Work, so fundamental to basic survival and health, as well as to wealth, well-being, and positive social identity, has its darker and more costly side too. Work can negatively affect our health, an impact that goes well beyond the usual counts of injuries, accidents, and illness from exposure to toxic chemicals [1, p. 1]. Peter Schnall, a clinical professor of medicine at the University of California, Irvine, Division of Occupational and Environmental Medicine (where he directs the program in work organization and cardiovascular disease), Marnie Dobson, a medical sociologist and a research associate at the Center for Occupational and Environmental Health at the University of California, Irvine, and Ellen Rosskam, policy scholar at the Woodrow Wilson International Center for Scholars, and public health and social protection specialist, have crafted a book that anyone interested in the health and well-being of working people ought to take a careful look at. Unhealthy Work addresses the topic of unhealthy work in three parts: The Changing Nature of Work (Part I) discusses the important changes taking place in the world of work in the context of the global economy; The Health and Economic Costs of “Unhealthy” Work (Part II) considers the growing body of scientific evidence on the effects of particular forms of work organization and work stressors on employees’ health and discusses how unhealthy work has become a major public health problem; and Interventions (Part III) takes a look at actions and approaches that can be taken to improve working conditions, prevent disease, and improve health. Authors present well researched, highly readable accounts of the epidemiological science supporting their conclusions that a lousy work environment leads to poor health. Thanks to a skillful job by the book’s editors, the reader comes away with a sobering understanding of the depth of human suffering caused by a poor work environment. In the introductory chapter the premise is offered that a good society “must have as a moral basis the well-being of its working people” [1, p. 3]. This view is tested in detailed articles from an extraordinarily able group of researchers. How work is organized, they suggest—its pace and intensity, workers’ degree of control over the work process, workers’ sense of justice, and the degree of employment security, among other things—can be as important to the health of workers as the chemicals in the air they breathe on the job. In other words, the less job security one has, the less say one has over the ways his or her work day is organized, and the greater the pace of work, the more likely a worker is to suffer what the book’s editors call the “hazards” of the “psychosocial” work environment. And, because the “transformations in work and work organiza- tion that began 200 years ago are now accelerating so much” [1, p. 5] because of globalization, these stresses are intensifying with every downsizing, plant closing, and off-shoring of work. As a former machinist, someone who dunked his arm up to his elbow in a bucket of trichloroethylene numerous times a day for several years, another of the book’s premises resonated. We think of disease and illness in terms of risk factors or health habits or lifestyles or genes of an individual; we think of prevention as directed toward changing the individual—for example, through stress management techniques, more exercise, or healthy eating habits—rather than toward changing the workplace, the community, or economic or political systems [1, p. 11]. Never once when I had a physical during my “machining years” did any doctor ask me what I did for a living beyond the very basic chit-chat of did I have a job. What I breathed, how my work was paced, and what I dunked exposed skin into were not conversation topics. Only years later when I ran across the work of Peter Schnall and others and learned about the Japanese term karoshi, which literally means a person working himself to death, did I become deeply concerned with the questions with which Unhealthy Work wrestles. In addition to the increase of global economic inequality and the steady replacement of secure employment with insecure and flexible labor, neo- liberal economic and political policies and the global economic restructuring that has resulted from them have dangerously challenged workers’ repre- sentational politics and voice worldwide [2, p. 24]. Paradoxically, while globalization has undermined wages and workers’ well-being, it has sparked very intense labor protests against harsh work regimes in several countries, including China, where in the spring and summer of 2010 workers protested in several high-tech plants against the pace and pressure of their required labor. In the midst of the “Great Global Recession of 2008,” working conditions are worsening and, as the case studies in Unhealthy Work reveal, the impact on physical illness (mainly cardiovascular disease, hypertension, and diabetes) and mental illness (mainly depression) as well as lost productivity, is staggering. Summarizing the case studies in the book, Schnall, Dobson, Rosskam and Landsbergis report that by the age of 50, most members of the U.S. workforce suffer from at least one work-related illness and sometimes more, including injuries (e.g., back, neck, and repetitive strain injuries); work-related mental health conditions (including burnout, depression, and anxiety-related disorders); or cardiovascular heart disease of one form or another, including hypertension and coronary artery disease [3, pp. 331-332]. What’s disturbing here is the fact that for the most part we now do poorly addressing even many of the workplace’s more obvious and easily seen dangers, as evidenced by such things as oil rigs blowing up, coal mines caving in, and high-tech workers being exposed to highly toxic cleaning agents. So, how do we move forward the important arguments that are raised in Unhealthy Work? The book should be read by anyone who cares about public health, workplace health, and the skyrocketing costs of health care. Don’t let the science scare you; even a historian like me got the message loud and clear. “Chronic illnesses, such as depression, hypertension, and coronary artery disease appear to be ‘modern epidemics,’ the consequences of excessive environmental load (such as chronic stressors at work) on the human organism over prolonged periods of time” [3, p. 334]. Now, just like the Happy Meal, we are exporting this workplace harm to unsuspecting workers in the ever-expanding global supply chain. There oughta be a law! 1. Deborah R. Gordon and Peter L. Schnall, “Introduction,” in Unhealthy Work: Causes, Consequences, Cures, eds. Debora R. Gordon and Peter L. Schnall (Amityville, NY: Baywood, 2009), 1-15. 2. Chrisy Moutsatsos, “Economic Globalization and Its Effects on Labor,” in Unhealthy Work: Causes, Consequences, Cures, eds. Debora R. Gordon and Peter L. Schnall (Amityville, NY: Baywood, 2009), 21-36. 3. 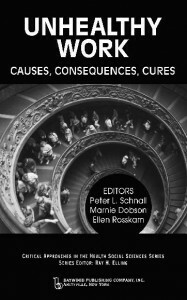 Peter L. Schnall et al., “Curing Unhealthy Work,” in Unhealthy Work: Causes, Consequences, Cures, eds. Debora R. Gordon and Peter L. Schnall (Amityville, NY: Baywood, 2009), 331-350. 1. Schnall PL, Dobson M, Rosskam E. (eds.) Unhealthy Work: Causes, Consequences, Cures. Baywood Publishing, 2009.